I was 10 years of age and smashed my head accidentally on two steel bars and a cement floor. I laid in a coma for almost 3 months. Dr. Greene found a solution and after following the protocol I woke up. I didn’t know anyone. I didn’t know my name. I could not longer write with my right hand because it would shake. For 15 months I stayed in a dark, silent, room, and gradually learned to walk, talk, read, and write with my left hand, and read a book by Dorthea Brande called Wake Up and Live. I would get dizzy still and fall over. So when I was finally ready to go back to school so they thought I did. I lasted one week when the school authorities said I could no longer go because I was Mentally Retarded. I was different. I was slow of speech but my mother caught me reading the books I loved the most, my Bible and Encyclopedias one day and asked if I understood what I was reading. I nodded yes. So you understand you just can’t keep up. I had no memory so had to journal everything which I have done to this day. I was odd. A new start in Calgary in a new school board maybe would be different but alas I was told, we don’t have room for your kind here in this school. I chose ski racing because the time on the course spoke for me when I didn’t need to speak. I decided in my first race I would enter twice. Once as Mark Hunter my real name and the second time as Jim Hunter. Mark fell 4 gates from the finish, and Jim finished dead last. The Skimeister’s chose 10 girls and 11 boys to go on to the next camp. I started #169 dead last and finished #169. the other 10 boys were the fastest 10. The coach chose me as the 11th because if a kid has the desire to enter twice we have to give him a chance for his effort. For me it decided who would be a ski racer and who would be a hockey player. 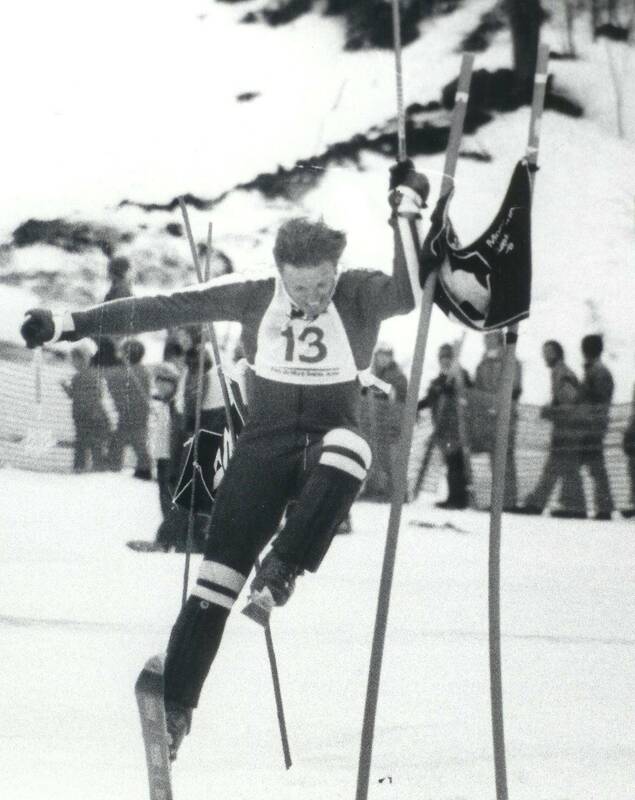 I chose this photo today because I was a gate from the finish in the 1976 Dual Slalom finals and had just beat one of the best slalom skiers in the world Piero Gros and celebrated because I heard people saying at the start that a Downhill Racer would never be a great slalom skier. Victory is only ours if we use the support of #BellLetsTalk to secure Victory over Mental Health.